The galleries of Manhattan's Chelsea neighborhood and even the upstarts in the Lower East Side have never seen anything like ArtV, welcometoCOMPANY.com 's mobile art gallery. This ArtV mobile art gallery is the most innovative effort I've seen in a long time...and i see quite a bit. WelcometoCOMPANY.com’s ArtV is a 36 foot recreational vehicle retrofitted as a mobile, pop-up art gallery that is staking a claim on the future of displaying art. Lately the ArtV has been spotted at the Matthew Marks Gallery in NY’s Chelsea neaighborhood for the packed Nan Goldin opening and then last weekend the innovative art offering participated in Rema Hort Mann Foundation's Lower East Side Art Crawl spotlighting emerging art and all the new galleries dotting Manhattan's Lower East Side. Coffee and Prosecco was flowing freely as WelcometoCOMPANY.com ‘s mobile art gallerinas were welcoming large groups RHM members. “This is the coolest thing I’ve experienced in the art world in years. As an emerging artist I have been wresting with how make my art more accessible, really reach the public anot just the 2% jaded art snobs. This mobile art gallery literally takes the artwork to the streets. Totally dope,” commented Dani Howard of Brooklyn during the art crawl. And Quang Bao, Director of the Rema Hort Mann Foundation dubbed the effort: "ArtV was without question the most memorable and easily talked-about of the various projects within the art crawl." Disrupting the traditional gallery system seems to be a hot trend what with the proliferation of online art websites; but as one of the fastest growing companies, WelcometoCOMPANY.com is easily the most ambitious.In addition to its mobile art gallery, this early stage company hosts a monthly meetup for new art enthusiasts called The Collector Series™ and they are producing a documentary series to discover emerging artists in each of NYC’s boroughs which will air on cable TV beginning in January for 6 weekly episodes. “ Art is life and if there is a way to make it more approachable to everyone without the attitude or economic intimidation, then I gurantee we will try it. It is way too much fun so why not? Claims welcometoCOMPANY.com Founder/Prexy CJ Follini. Next up, the ArtV will take its act on the road as it travel to Miami for the entire week to North America’s largest international art fair - Art Basel/Miami. 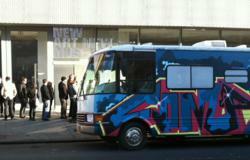 The graffiti-bombed RV will shuttle anyone and everyone between the myriad of fairs while hosting a daylong mobile party. And beginning December 10th, the ArtV will be stationed and open for business One Hanson Place in Fort Greene to coincide with the weekly winter Brooklyn Flea market on Saturdays and Sundays until late spring. Welcome to COMPANY (http://www.welcometocompany.com ) is an online and offline social network connecting collectors of contemporary art while providing compelling content, an on-line art exchange and original art works from emerging artists for sale commissioned by COMPANY. With the debut of its off-line networking salon – The Collector Series - and its cable TV show - Art/Trek NYC - COMPANY offers advertisers a multi-platform advertising opportunity to a highly sought-after targeted demographic. Welcome to COMPANY.